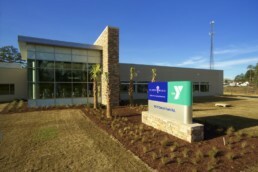 The Wade Walker Park Family YMCA Recreation Center and pool is the product of a partnership between DeKalb County and the Metro Atlanta YMCA. The building design centers around a welcoming multi-story lobby, which serves as the main entrance and organizing element for the aquatics, athletics and education programs. The lobby is a beacon to those approaching the building with large glass windows. Two main wings extend out from the lobby, providing plenty of natural light. The new building features a natatorium, gymnasium with a full basketball court and a suspended running track above, an instructional pool, a whirlpool, an outdoor leisure pool and a sauna off the pool deck. The building design centers around a welcoming multi-story lobby, which serves as the main entrance and organizing element for the aquatics, athletics and education programs. The building achieved LEED-based certification.